Perlin was born with a developmental disability and receives services from Florida’s Agency for Persons with Disabilities (APD). October is National Disability Employment Awareness Month, and APD is highlighting the workplace achievements of people with developmental disabilities and recognizing employers that hire them. According to Parlin’s Publix supervisor Yadira Gray, “She is friendly to the customers, and an overall good employee.” During slower periods at the store, Parlin retrieves carts, cleans and organizes the cash register counters, and returns unpurchased items to the shelves. “Cindy willingly does any task that is asked. 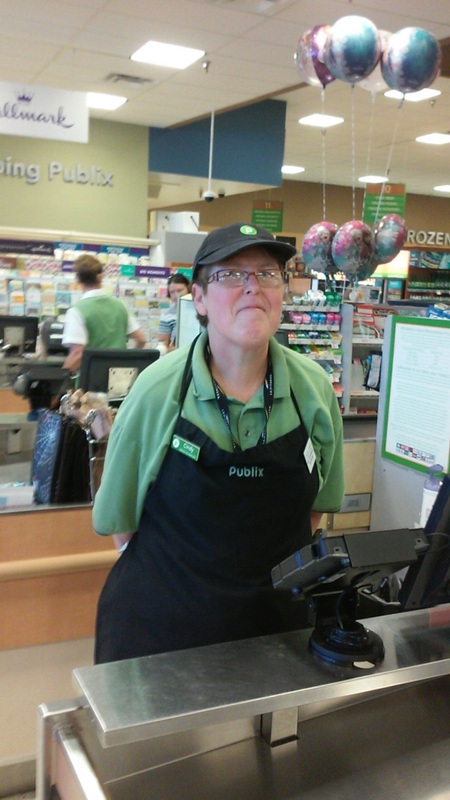 All of the Publix staff love and assist Cindy when needed,” said Masterson. Parlin lives with her cat and her cousin, who winters in Florida with her part of the year. Parlin attends school at Suncoast Technical College, which provides her the opportunity to learn skills and develop knowledge in various subjects. She has learned about many subjects such as Microsoft PowerPoint, nutrition, and artwork. As part of her studies, she also participates in field trips to restaurants and local parks. When asked what she does in her spare time, Parlin said, “I like to prepare my own meals, especially meatloaf. It’s one of my favorite dishes. I like to use oatmeal instead of breadcrumbs because it has less calories and more nutritional value.” Parlin also enjoys crocheting. She makes beautiful scarves for her friends and family. She is also passionate about cats and volunteers at the Cat Depot. She recently attended a class to learn more about how to care for cats. In the future, Parlin plans to continue her employment at Publix, as well as crocheting scarfs to give as gifts to those she holds dear.